It is inevitable that a portion of your subscriber list is going to lose interest and die off. That being said, how do you control the number of people that stop opening your emails? Having your subscribers stop opening your emails but stay on your list can seriously hurt your email engagement rate or mark your emails as spam. That is not a path at any marketer wants to go down. So why should you do a re-engagement campaign, is it really worth it win back maybe 10-15 subscribers? Let me break down the steps to take in order to have a successful re-engagement campaign and then give you 5 examples of the best campaigns out there! Define your subscribers between someone who is inactive and someone who has not opened/clicked within a certain amount of time. This can help you determine who is worth re-engaging and who isn’t. Look at your subscriber history and use the average time between when they signed up and when they stopped engaging with emails and strategize around that window of time. Try to catch them before they become totally inactive that way you have a chance of winning them back! Remember, your subscribers are familiar with how your emails look and the content you present. Try to switch it up and think about a fresh way of presenting your content. For example, if you always send HTML emails, try a text based one. You can also switch it up with a survey and have your audience tell you what they want to see! You might be surprised by the answers. In today’s age the amount of emails that we all receive can be overwhelming. Try to only send emails once a week but make them really valuable. That way your emails are jam-packed with the information all at once, making them a can’t miss. Going into your re-engagement campaign, know that you are not likely to see a ton of your subscribers move over to your active list. But getting only a small percentage is a win, regardless! After you’ve tried your campaign to woo back your inactive subscribers, you’ll be able to part ways knowing that you tried. This way you can move on to focusing on your active list. Just remember that there is benefit in not removing your inactive list, they can still find their way back you through an old email and engage to move them over to your active send list. Now that you know the best strategies of a re-engagement here are some examples of the best campaigns. You might even get a little inspiration. 5 examples of the best re-engagement campaigns out there! Who doesn’t love a free treat on your birthday and feeling a little extra special? 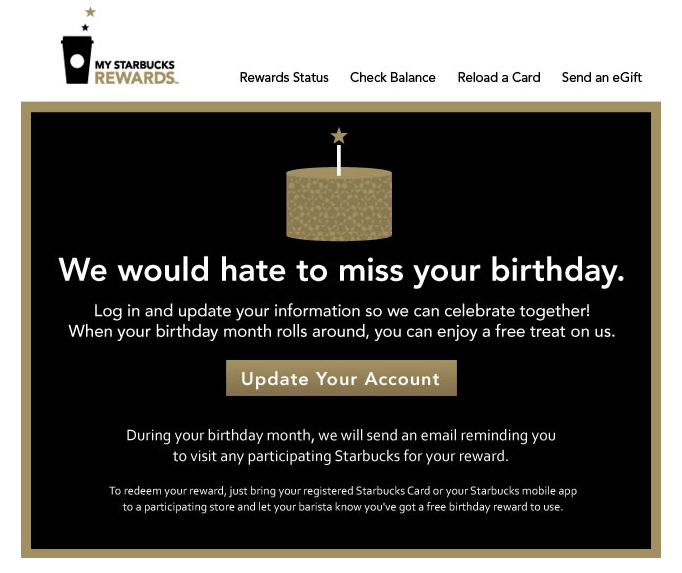 The re-engagement email from Starbucks is strategically timed and gives you information that is relevant to you the subscriber. Giving subscribers a free treat is great way to re-engage your audience. Not only are you encouraging customers to come into the store but you are also catching their attention via email. 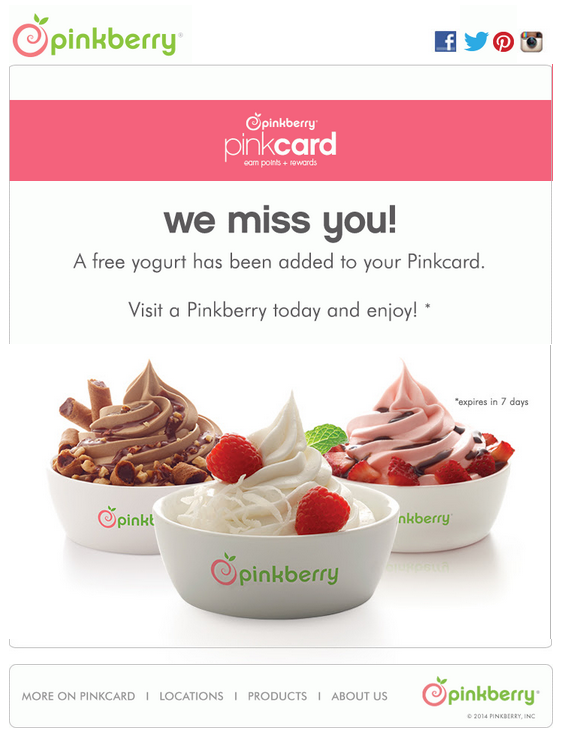 Now they might be more likely to open your emails, hoping for another free treat. One of the best ways to win back lost subscribers is to remind them why they subscribed in the first place. JetBlue breaks it down in email by stating what options they offer for subscribers and how they can improve. 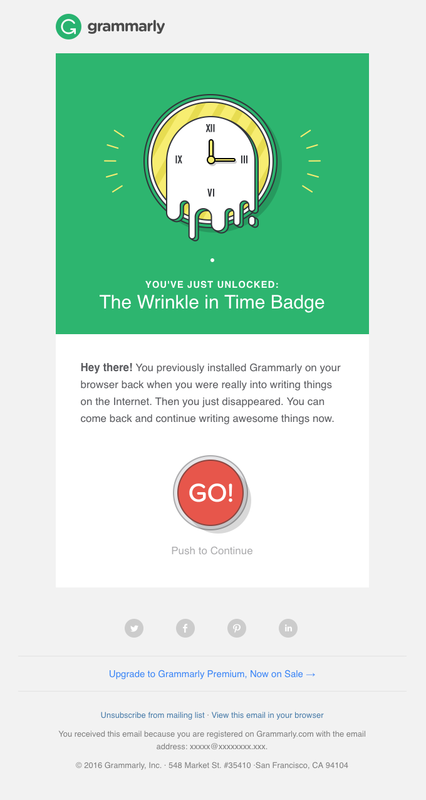 Grammerly re-engages their inactive subscribers by presenting them the option in a different context. By calling the action a “wrinkle in time” badge subscribers are more enticed to figure out what that means. The prominent CTA button “GO” also tempts the subscriber to take action and use their service again! Return Path builds a brief background for the re-engagement and allows the subscriber to choose the types of communications they wish to receive. 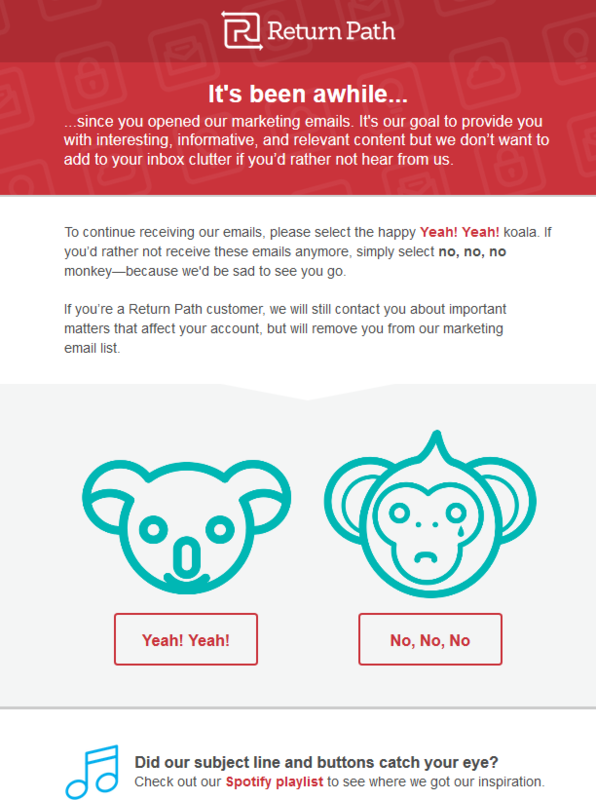 They demonstrate how the preference center works and end the email with two cute illustrations accompanied with related CTA buttons for options for engagement. 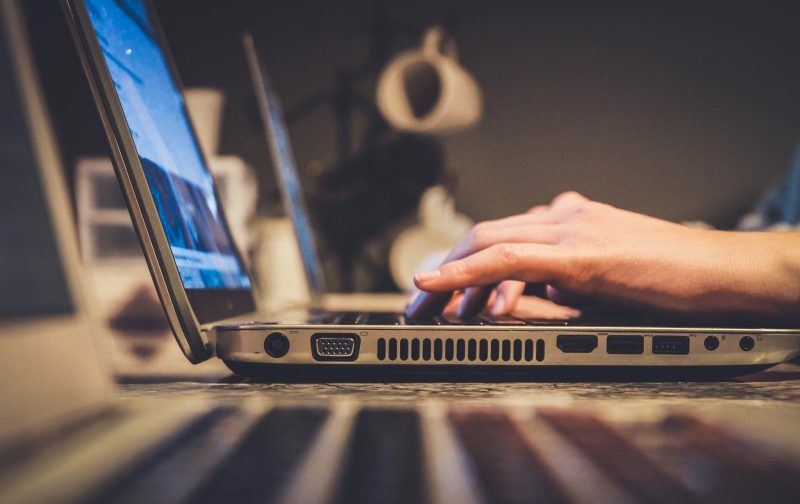 Now you have seen how to create a successful re-engagement campaign along with 5 examples of content to get you started. In your re-engagement campaign try fun CTA buttons, surveys, and creative banners and let us know how they work for you! If you like this piece and the others in our blog, make sure you subscribe to our newsletter and receive our newest pieces all at once every week. 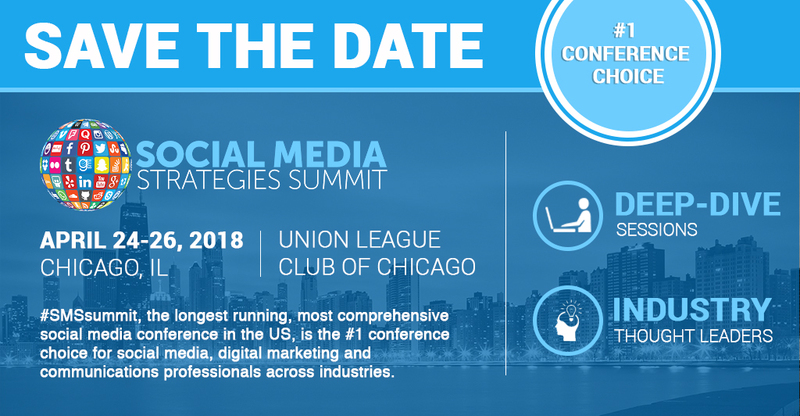 Also, make sure you check out the Social Media Strategies Summit, Chicago April 24-26th.